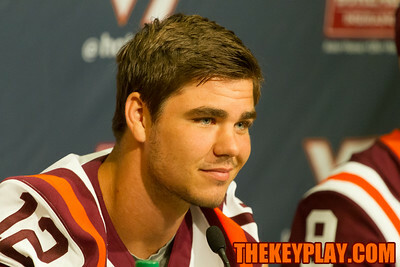 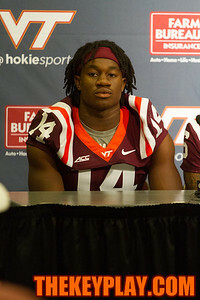 Virginia Tech's coaches and players gathered to address the media on August 9, prior to the 2014 season. 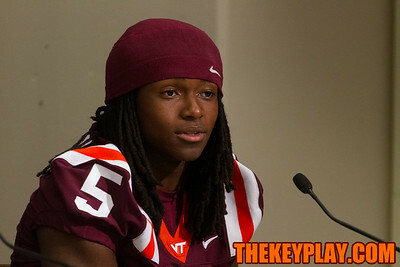 Trey Edmunds speaks with the press. 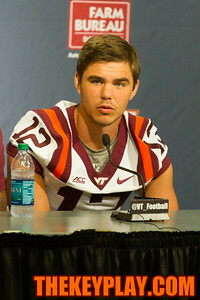 QB Michael Brewer answers a question during media day. 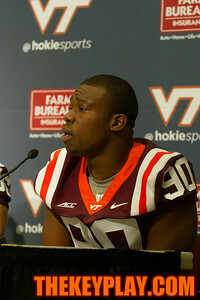 Mark Leal speaks with the meda. 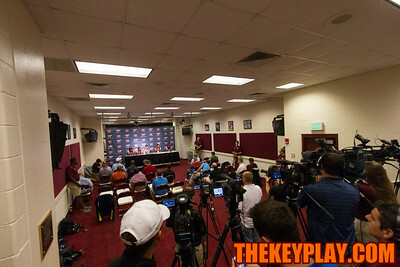 The press conference room in the South stands during Virginia Tech's media day. 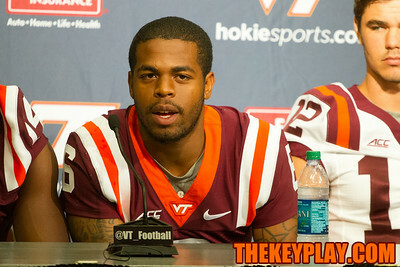 Joshua Stanford answers a question at Virginia Tech's media day. 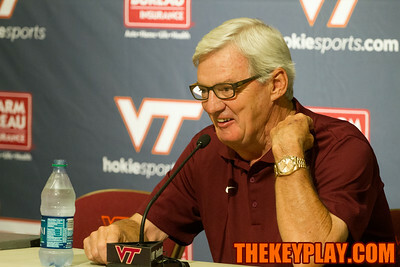 Michael Brewer listens to a question from the press. 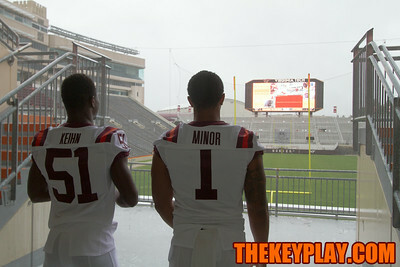 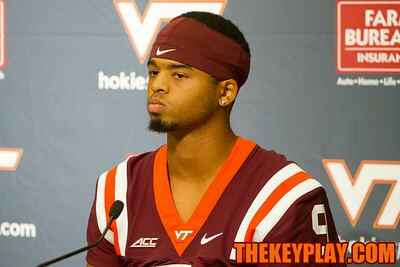 Brenden Motley looks on as Virginia Tech's media day gets underway. 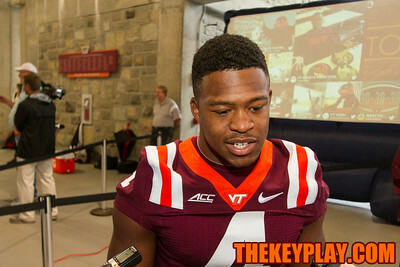 Kyshoen Jarrett looks at one of his teammates as they answer a question at media day. 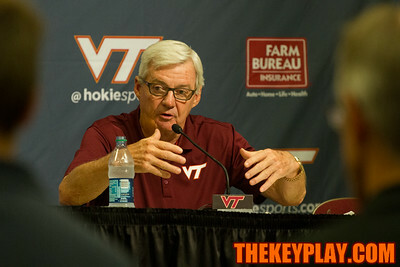 Dadi Nicholas speaks with the press. 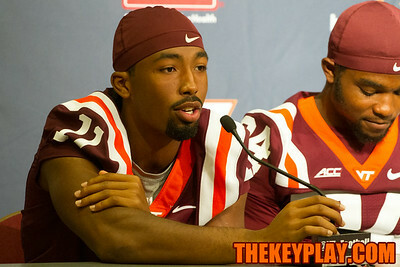 Kendall Fuller talks with the media. 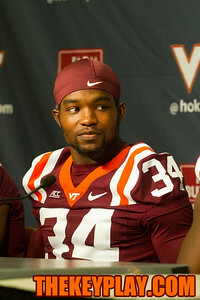 Detrick Bonner listens to a question from the media. 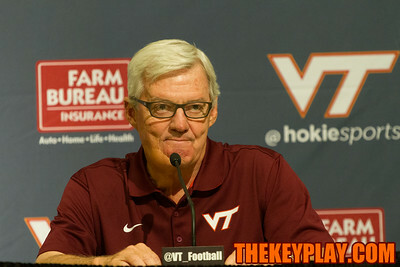 Frank Beamer at Virginia Tech's media day. 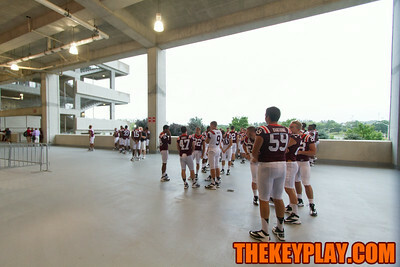 The team had the open interview time under the South Endzone stands due to the rain. 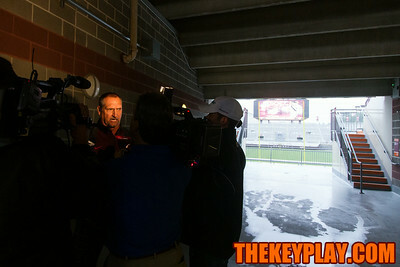 Bud Foster gets interviewed under the South Endzone stands during Media Day. 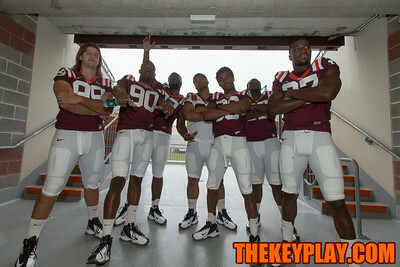 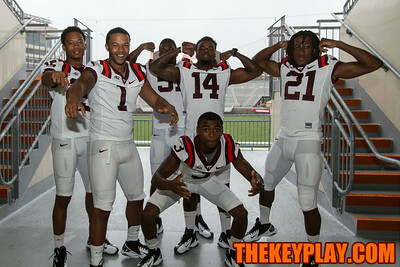 Defensive players pose for the media under the South stands. 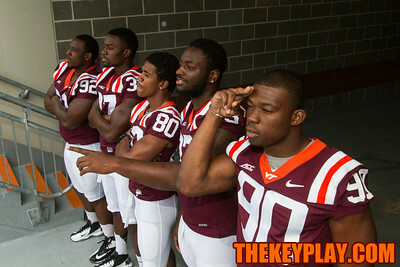 (left to right) Luther Maddy, Ronny Vandyke, Demitri Knowles, Darius Redman, and Dadi Nicholas look out over the field. 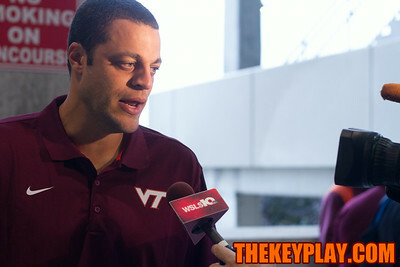 Wide recievers coach Aaron Moorehead. 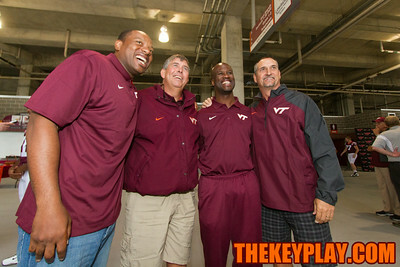 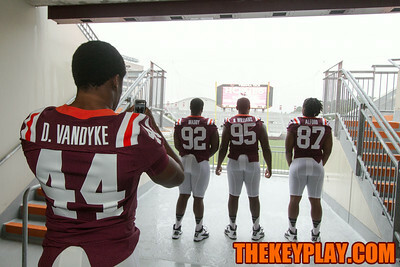 Devin Vandyke takes a photo of Luther Maddy, Nigel Williams, and Dewayne Alford. 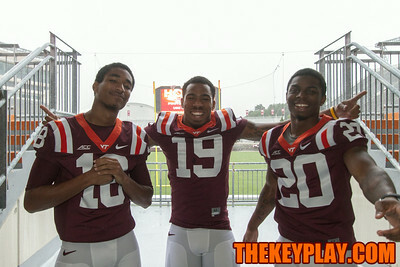 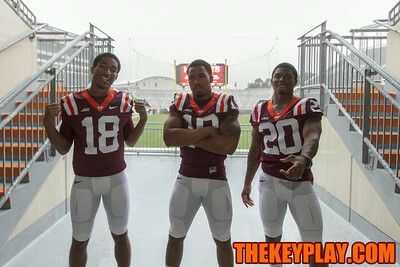 David Prince (18), Chuck Clark (19), and Deon Newsome(20) pose under the South stands. 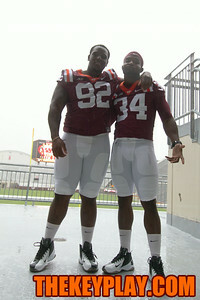 Luther Maddy (92), and Kyshoen Jarrett(34) under the South stands. 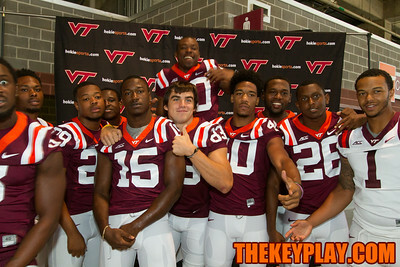 Joel Caleb(15) poses for a photo for his teammates. 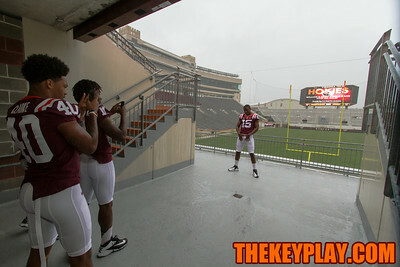 Players pose for the media inside the South stands. 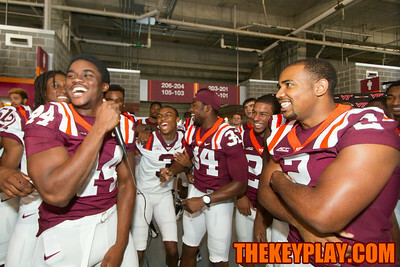 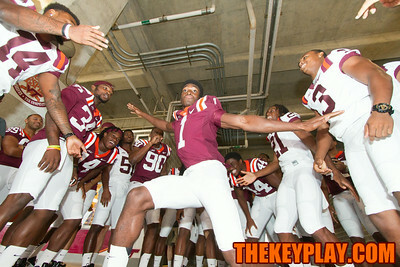 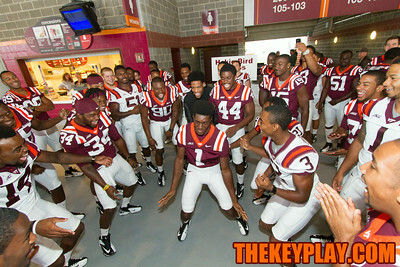 The players have an impromptu dance-off during some downtime. 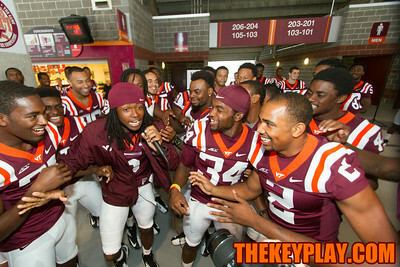 Rap battle under the South stands. 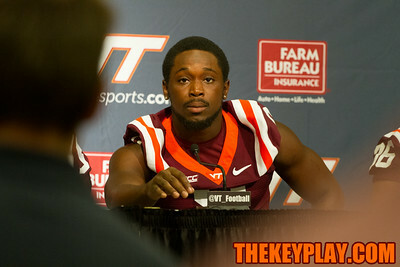 J.C. Coleman talks to the press. 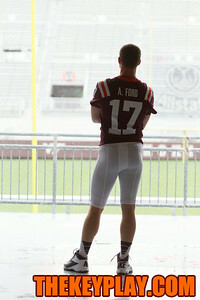 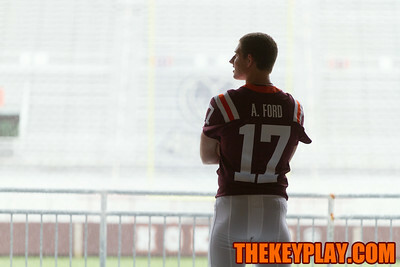 Andrew Ford looks out over Lane Stadium from the tunnel in the South stands. 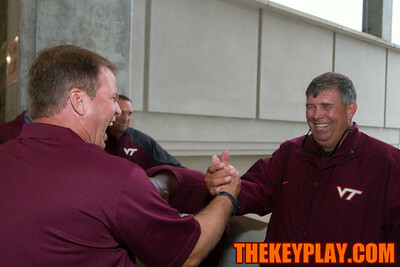 Bryan Stinespring (left) and Charley Wiles (right) share a laugh as media day winds down. 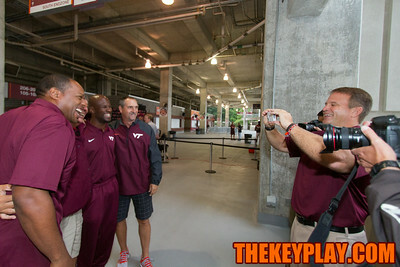 Bryan Stinespring (right) takes a photo of the other coaches.